Here’s an easy way to change your money beliefs! Try this self-hypnosis recording I created with the expert help of certified hypnotherapist Gary Meyer. While you are relaxing and listening your subconscious will be taking in positive money messages. 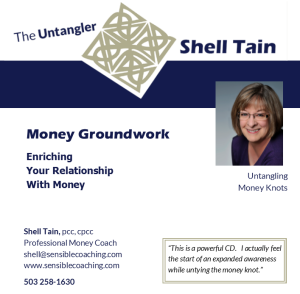 Listening will help you reframe and change the beliefs that are keeping you from having a great relationship with money. We just don’t get positive money messages anywhere. Money is too taboo a topic to talk about. Because of that most of us are stuck with really grungy beliefs about a topic that need not be that way. This is a relaxation tape so please do not listen while driving. It not only is likely to put you to sleep it actually works better that way. Give yourself an easy way to will help your inner money thoughts be more positive. Once we have been notified of your payment by Paypal, Shell will send you an email with a link and a password.